Senior/Disabled Passengers must have a Senior/Disabled TAP photo I.D. card to qualify for a reduced fare. To see if you qualify, apply here for a Senior/Disabled TAP card or call (661) 945-9445. Click here for information on Senior Annual Passes and Rider Relief Transportation Program. Children 44 inches and under in height ride free on regular transit only. Limit four (4) free children per fare paying adult. Each additional child will pay 25 cents. Active Military and Veterans Ride Free with proper identification on AVTA Local Transit during regular service hours! All other passes are available and can now be purchased online or at a local vendor and stored on your reusable TAP card. Please note, a one-time non-refundable fee of $2.00 will be charged upon TAP card issuance. What is a TAP card? Click here to load your TAP card online. Passes or stored value may also be loaded at the AVTA Business Office during regular office hours. Cash, credit/debit, and transit vouchers are accepted at this location. Personal checks are not accepted. 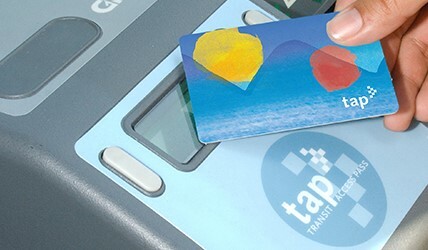 Your TAP card can also be loaded over the phone by calling 1-866-TAPTOGO (827-8646).